Combine wrap: Who boosted their draft stocks? FOR ANOTHER year the NAB AFL Draft Combine is over, meaning there is nothing left to show for prospects wanting to find their way to an AFL club at next month's draft. It was a new-look combine structure this year, with the 'beep test', 3km time trial, repeat sprints test and clean hands test all gone from the regular format. The Yo-Yo running test replaced the beep, and the time trial was cut down to 2km to better reflect what AFL clubs do in their pre-seasons. But what does it all mean? AFL.com.au has answered some of the most important questions to come out of the four days at Etihad Stadium and how it might impact who goes where when names are called at the draft in Sydney on November 24. 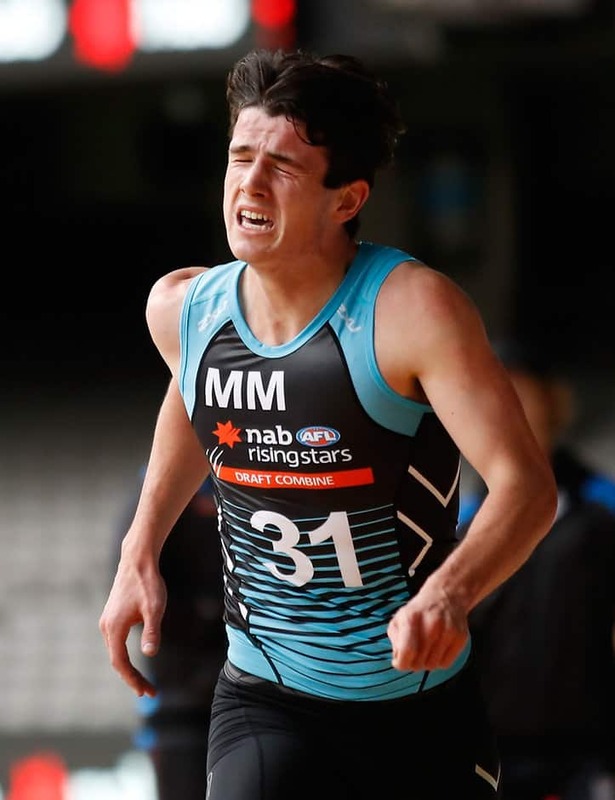 Andrew Brayshaw, the brother of Demon Angus, came into the combine on the back of a terrific end to the season for the Sandringham Dragons, and continued his rise with a strong set of testing results. He proved his endurance by taking out the Yo-Yo test and came fourth in the 2km time trial, while he was also among the top-10 in the agility and highlighted his sure skills by being among the best in the goalkicking test. He's a star and looks a top-10 pick. Aiden Bonar was one of the stars of the week, equaling the all-time standing vertical jump record and also coming second in the 20-metre sprint with a time of 2.9 seconds. Clubs were pleased to see him out there given his knee injury history and he proved his power and athleticism. Of some guys likely to feature later in the draft, Ben Miller's results will see clubs go back and have a look at his game. The West Australian key position prospect was equal winner of the agility test and ran 2.91 seconds in the sprint, while he also kicked a perfect score in the goalkicking. He arrived as a likely later pick or rookie, but that movement for a 196cm prospect is hard to find. Ben Paton's speed, Brent Daniels' mix of agility, endurance and pace, Alex Martini's aerobic base, Tom McCartin's raw running and jumping, and Kane Farrell's leap and agility also made those prospects, who are likely to feature a touch later in draft proceedings, stand out. Plenty. The list of players unable to participate in any testing was long and included some higher profile names. Cam Rayner (knee), Paddy Dow (shoulder), Adam Cerra (shoulder), Luke Davies-Uniacke (toe/calf), Charlie Constable (hip) and Darcy Fogarty (knee) were among the likely first-rounders who couldn't test due to injury issues. Talls Callum Coleman-Jones (knee), Tom De Koning (lacerated kidney) and Brayden Crossley (ankle) couldn't test, while Andrew McPherson (hamstring), Tom North (foot), Brandan Starcevich (quad), Charlie Spargo (shoulder) and mature-ager Tim Kelly (knee) were also forced to watch on from the stands. Lachie Fogarty, meanwhile, missed the whole week with illness. There were others who found injury issues throughout the combine that prevented them from completing all testing. Hunter Clark had a knee problem, Patrick Naish dealt with a back spasm, Hugh Dixon had some hamstring tightness flare up and Harrison Petty sprained his ankle during the kicking tests and was ruled out for the rest of the week. Brayden Ainsworth (hamstring), Oscar Allen (shin), Noah Balta (knee), Toby Wooller (ankle) and Ryley Stoddart (hamstring) also had injury complaints that stopped them from doing everything. How significant are the results at combine week? It's case by case with this one. For some players it is important to test well, but that might be more for prospects who fit in later in the piece. For instance, Nick Shipley did his draft chances no harm with good results in the speed and endurance tests, so will further his chances. For someone like Nathan Murphy, who hasn't been through much testing due to his cricket background, it was also important for clubs to see him in the screening and to see how he went, which included an impressive 6:21 minutes in the 2km time trial. But his is a rare case, because most of the data on players is already known by now. That's not to say it doesn't matter. Clubs will have followed and tracked testing results from the start of the year and perhaps challenged prospects to improve in certain areas, so the combine gave them a chance to see whether they had done that or not. That's where clubs might have been hoping to see a better 2km time trial from ruckman Sam Hayes, who is the best big man in the draft but needs to lift his aerobic base. Did the combine help shape the No.1 decision? Not at all. The players most considered to be in the mix for that pick – Rayner, Davies-Uniacke, Cerra and Dow – all didn't participate due to injury, so the Lions (should they keep the top selection), wouldn't have learned much extra about their options this week. The Lions have been strong on their desire to add midfielders to their list via this year's draft and trade period, so will that sway them more towards Davies-Uniacke, Dow – or even Brayshaw – ahead of Rayner, who at this stage is seen more as a half-forward to can play in the midfield than the other way around? That will have to come into their considerations. But Rayner's ability to impact a game wherever he's playing, his power and explosiveness, and his dangerous presence around goals makes him a unique and very appealing option. He, Dow and Davies-Uniacke are seen as the most likely contenders at this point, with Davies-Uniacke's finals performances for the Dandenong Stingrays at TAC Cup level reminding all of his serious talent as a big, strong and versatile midfielder. Who is rising up the board? Brayshaw has been the one, but his rise can't go much further. He now sits comfortably among the better midfielders in the draft pool and seems a likely early choice. Ed Richards didn't blow anyone away with his testing but his end to the season should see him ranked highly, while Gryan Miers could also sneak into the top-30 after what was a very good season as a small and creative forward. Jordan Houlahan had a good combine in showing his leap, but he also finished the season well in South Australia and has some excited by his potential up forward. Matt Ling also could have pushed himself into the first 25 players picked after doing some nice things through the finals, while Bonar's testing and flashes late in the season might see a club grab him early on draft night.